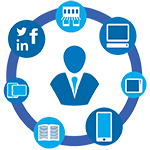 Leverage your CRM and other data assets on own and paid media for people based engagement. Use your CRM data and other data sources to personalise the interaction with your customers across owned and paid media. Deliver marketing campaigns in a consistent way regardless of which channel your customers are using and with the knowledge of the previous steps of the customer journey. Identification and data activation allow for immediate reduction in wasted media spend through more efficient targeting and by excluding existing customers across owned and paid media. Deliver advertisements and next best actions to prospects and customers that really matter to them based on what you already know. Teavaro helps you integrate your disparate (offline and online) data sources - from analytics, CRM, DWH to data partners, and provides data activation in real-time or via batch.